Here are today's Daily Conlon card numbered #171 of former Brooklyn Robins catcher Chief Meyers. He chats a bit about how "Ballplayers Were a Rowdy Bunch" and how much the game has changed. 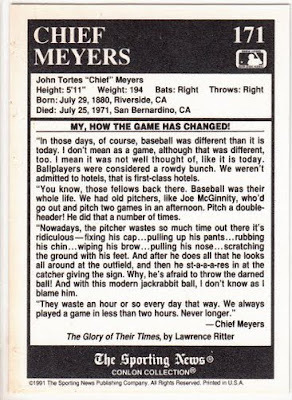 "In those days, of course, baseball was different than it is today. I don't mean as a game, although that was different, too. I mean it was not well thought of, like it is today. Ball players were considered a rowdy bunch. We weren't admitted to hotels, that is first-class hotels." "Nowadays, the pitcher waste so much time out there it's ridiculous- fixing his cap... pulling up his pants... rubbing his chin... wiping his brow... pulling his nose... scratching the ground with his feet. And after he does all that he looks all around at the outfield, and then he st-a-a-a-res in at the catcher giving the sign. Why, he's afraid to throw the darned ball! And with this modern jackrabbit ball, I don't know as I blame him." Following up on yesterdays post featuring Dodger base cards to the 2011 Allen & Ginter set, here are some of the inserts you can find. The next two cards are RIP cards within the set. 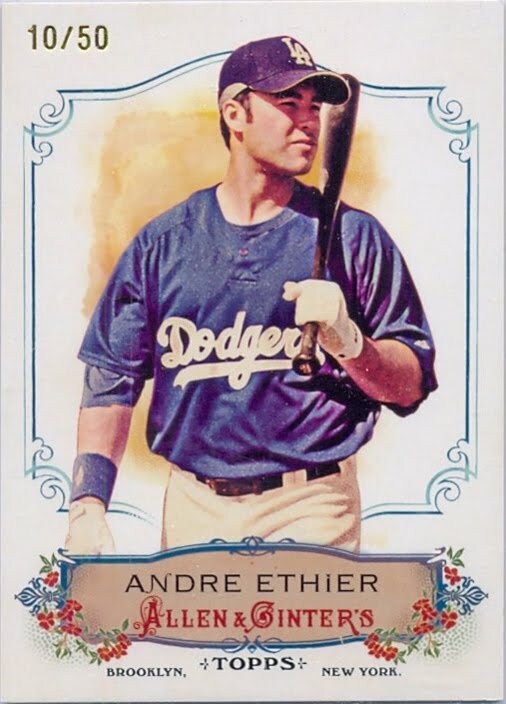 They are limited in production (the Andre Ethier below is numbered to 50), and contain a hidden mini card inside of it. All you have to do is pull on a tab on the reverse to reveal the hidden treasure. Over time, some of the cards get "ripped" while other remain in its original prestine shape, so prices can vary widely depending on if your a betting man or not. One thing is for sure, most of the mini cards within RIP cards are much scarcer and therefore worth more than your average card. Anyway, there are 3 Dodger RIP cards available- see two of them below. I have yet to find a Clayton Kershaw to show you. 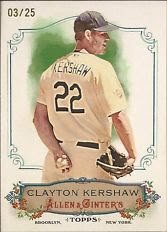 This is an example of a mini Kershaw card that can be found within a RIP card. Notice that it uses a different photo than the normal base card. 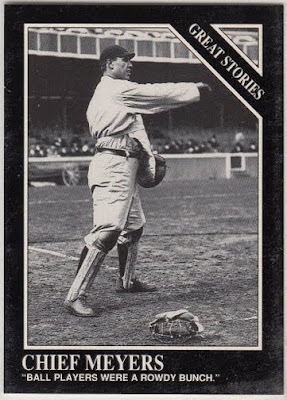 The Hometown Heroes insert set is one of the more common sets in Allen & Ginter. Three Dodgers are represented. See them below. I know of only two Dodger relic cards within this years set. 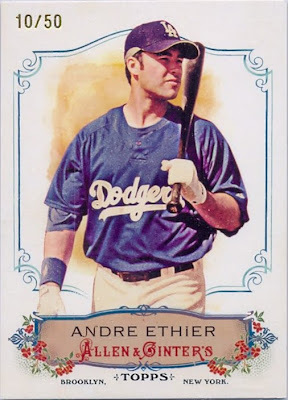 It includes a uniform piece of Ethier and a bat cards of James Loney.